Draft: 2010, Pittsburgh Pirates, 4th rd. 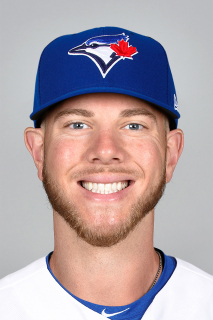 Nicholas Gordan Kingham...Is a 2010 graduate of Sierra Vista High School in Las Vegas, NV...Went 8-3 with a 2.01 ERA and 73 strikeouts in 13 games as a senior in high school and was named First-Team All-State...Was the No. 2 recruit in the state of Nevada in 2010 (No. 156 nationally) according to PerfectGame and signed a letter of intent with Oregon...Sit out his junior year at Sierra Vista after transferring...Went 10-1 for his legion team, the Las Vegas Lions, in 2009...Signed by Pirates scout Larry Broadway. Began season with Triple-A Indianapolis... Was the Opening Day starter on 4/6 vs. Columbus; gave up one hit and struck out 10 batters in 5.0ip of a no-decision... Was named International League Pitcher-of-the-Week for the week of 4/5-15...Was recalled by Pittsburgh on 4/29 and made his Major League debut that afternoon vs. St. Louis...Retired each of the first 20 Cardinals batters he faced in his big league debut and allowed just one hit in his 7.0 scoreless innings of work...According to the Elias Sports Bureau, it was the most consecutive batters retired to start a game by a pitcher in his Major League debut in the expansion era (since 1961)...Also became the first Pirates pitcher to record nine strikeouts in his Major League debut since Zach Duke on July 2, 2005, at Milwaukee...Made his second big league start on 5/4 at Milwaukee and won a 6-4 decision (5.1ip/4er)...Was optioned back to Triple-A on 5/7... Received a no-decision on 5/9 at Louisville (6.0ip/3er)... Was transferred to Double-A Altoona on 5/10...Suffered a 7-3 loss vs. Richmond on 5/14 (5.0ip/7h/4r/4er/1bb/4so)... Was recalled by the Pirates on 5/19 and suffered his first big league loss that night vs. San Diego (6.0ip/3er)... Was optioned back to Indianapolis on 5/20...Threw just 1.0 inning (11 pitches) on 5/25 at Charlotte...Was recalled by Pittsburgh on 5/28 and made his fourth start with the Pirates on 5/29 vs. Chicago-NL (5.1ip/3er - ND)...Suffered his third big league loss on 6/9 at Wrigley Field (the Pirates were held to just one hit in a 2-0 loss)...Was optioned to Indianapolis on 6/10 when Ivan Nova came off D.L...Took a perfect game into the seventh inning and pitched 8.0 scoreless innings while beating Toledo on 6/14...Was named the I.L. Pitcher-of-the-Week for the week of 6/11- 17...Was recalled by the Pirates again on 7/2 to replace the injured Chad Kuhl in the starting rotation...Made his seventh big league start on 7/2 at Dodger Stadium and gave up seven runs (five earned) in 3.0+ innings while losing his fourth straight decision...Snapped an 0-for-12 start to his hitting career with a two-run double off Philadelphia's Drew Anderson on 7/8 while also snapping his four-game losing streak on the mound...Tied career high with nine strikeouts while winning a 7-3 decision on 7/13 vs. Milwaukee...Won his third straight start on 7/21 at Cincinnati (6.1ip/2er) and also tallied a two-run single as a batter...Lasted just 3.0+ innings and gave up six runs while suffering loss to the Mets on 7/26 at PNC Park...Threw 51 pitches while giving up four runs (two earned) in 1.0 inning in his start on 8/1 vs. Chicago (NL)...Was optioned to Indianapolis on 8/3 and made three Triple-A starts before being recalled a fifth and final time on 8/25...Made his first Major League relief appearance on 8/26 at Milwaukee and surrendered one run in 2.0ip...Gave up one run in 5.0ip while starting on 9/2 at Atlanta...Made his third and final relief outing on 9/8 at Miami; posted a 3.60 ERA (5.0ip/2er) as a reliever...Gave up six runs (five earned) in 1.1 innings in his start on 9/23 vs. Milwaukee... Made his final start on 9/28 at Cincinnati and allowed two runs in 3.2ip...Went 2-for-23 (.087) at the plate and led the pitchers with four RBI. Set a minor league career high in wins (10)... Began season on the 7-day disabled list at Triple-A Indianapolis due to a sprained right ankle...Pitched 4.0 innings against the Braves in an Extended Spring Training game on 5/1...Also gave up a run on three hits in five innings of a rehab start on 5/7 at Pirate City (74 pitches)...Was reinstated from the D.L. at Indianapolis and was transferred to Bradenton, where he pitched 5.0 scoreless innings and allowed just one hit while winning his start on 5/11 vs. Palm Beach...Returned to Indianapolis on 5/16 and won his first start on 5/17 at Columbus (5.2ip - 95 pitches)... Also won his second start on 5/17 at Columbus (5.2ip/2er)... Suffered first loss on 5/23 at Lehigh Vallley (6.0ip/3er)...Gave up just one run in 6.1 innings while winning his third decision on 5/28 at Rochester...Pitched a scoreless inning of relief on 7/14 vs. Louisville...Threw just 85 pitches (60 strikes) while tossing his first professional complete game in a 3-1 victory vs. Syracuse on 8/10...Won four straight starts while posting a 0.88 ERA (30.2ip/3er) and a 21-to-3 strikeout-to-walk ratio between 7/24 and 8/10...Gave up a season-high eight runs in 3.2ip on 8/26, but received a no-decision...Won each of his final six regular season decisions between 7/24 and 8/31...Won his only postseason start on 9/8 vs. Durham (7.0ip/4h/0r/3bb/4so). Spent entire season recovering from Tommy John surgery...Began a minor league rehab assignment with the GCL Pirates on 7/8...Missed one start due to a lumbar strain (retro to 7/26)...Was reinstated from Triple-A D.L. on 8/15 and was assigned to High-A Bradenton...Pitched 5.0 scoreless frames (64 pitches) and won his first start with the Marauders on 8/17 at Palm Beach...Tossed 6.0 scoreless innings and struck out seven batters on 8/23 at Jupiter (68 pitches)...Joined Double-A Altoona on 8/27 and made his first start with the Curve on 8/29 (6.0ip/3h/1r/1er/1bb/4so - 84 pitches)...Went 3-5 with a 2.93 ERA (46.0ip/15er) in 10 total starts with the three teams. Season was limited to just six starts with Triple-A Indianapolis...Suffered loss in first start on 4/9 vs. Columbus despite giving up just one run in 6.0ip...Picked up lone victory in his fourth start on 4/25 at Toledo...Made last start on 5/6 vs. Rochester; left the game in the sixth inning due to discomfort in his right elbow...Had surgery to repair the ulnar collateral ligament in his right arm on 5/27; surgery performed by Dr. David Altcheck in New York. Went 6-11 with a 3.34 ERA (159.0ip/59er) in 26 Minor League starts after splitting the season between Double-A Altoona and Triple-A Indianapolis...Established career highs in innings pitched...Ranked third among Pittsburgh farmhands in strikeouts (119)...Was scheduled to be Altoona's Opening Day starter, but did not pitch because of back-to-back postponed games...Made debut with Curve on 4/6 vs. Erie and tossed 6.0 shutout innings while picking up his lone Double-A victory...Did not surrender a home run in his first nine starts (50.0ip) thru 5/21...Had a 2.80 ERA (45.0ip/14er) over his final seven starts with Altoona before being promoted to Indianapolis on 6/12... Pitched 7.0 scoreless innings and struck out season-high eight batters in first Triple-A start on 6/13 vs. Durham...Gave up just one run in 7.0ip and picked up first Triple-A win in his second start on 6/18 vs. Gwinnett...Went 2-0 with a 0.34 ERA (26.2ip/2r/1er) in his first four starts with Indy...Gave up just two hits in 6.0 scoreless innings on 7/10 vs. Columbus...Pitched season-high 8.0 innings on 8/18 vs. Louisville. Went 9-6 with a 2.89 ERA (143.1ip/46er) and a career-high 144 strikeouts in 27 total games (25 starts) between Class A Bradenton and Altoona...Ranked second among Pittsburgh farmhands in strikeouts...Began season with Bradenton and established a team record with 13 strikeouts in his fifth start on 4/28 vs. Brevard County...Won six consecutive decisions from 4/22 to 5/24 and went 6-0 with a 2.47 ERA (43.2ip/12er) in an eight-start stretch from 4/17 thru 5/24...Was named to the Florida State mid-season All-Star team, but did not pitch in the game due to his promotion to Altoona...Made Double-A debut on 6/15 and earned the win (5.2ip/0r) vs. Trenton...Surrendered his lone home run with Altoona while suffering first Double-A loss on 6/21 at Bowie... Did not allow a home run in his final 12 appearances (61.1ip)...Made first bullpen appearance since 2010 when he started the resumed game vs. New Britain from 6/25 on 6/26; worked 5.0 hitless innings before giving up two runs on two hits in his sixth inning of work...Had his start on 7/1 at Binghamton halted due to rain after recording two outs...Made second "relief" appearance behind the rehabbing Jared Hughes on 7/17 vs. Bowie (6.1ip/0r)...Skipped a turn in the rotation on 8/9 to monitor his innings...Pitched 7.0 scoreless innings and whiffed eight batters in his final start on 8/30 vs. Akron...Went 2-1 with a 2.08 ERA (47.2ip/11er) in his last nine games (eight starts), beginning on 7/12. Spent entire season with Low-A West Virginia and set career high in starts...Ranked fifth among South Atlantic League starters in strikeouts per 9.0 innings (8.29) and fourth in the league in WHIP (1.19)...Went 0-1 with an 8.59 ERA (14.2ip/14er) in his first five starts before winning his first decision on 5/3 at Asheville...Produced a 1.77 ERA in four starts from 5/8-24 and posted a 2.84 ERA (25.1ip/8er) in five starts during the month of May...Lost six straight decisions from 5/8 thru 7/11...Pitched 6.0 scoreless innings and gave up just two hits while winning his second game on 7/17 at Augusta (game two)...Also tossed 6.0 shutout frames in his next start on 7/24 at Greensboro...Went 5-0 with a 1.49 ERA (36.1ip/6er) in a seven-game stretch from 7/17 thru 8/19...Did not allow more than two earned runs in any of his last nine outings, dating back to 7/17, and posted a 1.68 ERA (48.1ip/9er) in that time while holding opposing hitters to a .164 batting average (27-for-165) and one home run... Pitched a season-high 7.0 innings and had a season-high nine strikeouts in his last start on 8/31 vs, Delmarva. Spent entire season with the short-season State College Spikes and posted a team-best 2.15 ERA...Ranked third in the New York-Penn League in both ERA and fewest baserunners per 9.0 innings pitched among starters (10.14)...Led all Pittsburgh minor leaguers in ERA...Allowed five runs over 3.0ip while making Opening Day start in a loss on 6/17 at Williamsport...Struck out a season-high eight batters and allowed one run in 5.0ip, but suffered second and final loss in second start on 6/22 vs. Auburn...Went 6-0 with a 1.57 ERA (63.0ip/11er) in his final 13 starts...Did not allow more than one run in any of his final 11 starts, beginning on 7/8 to 9/1 (53.0ip/8r/7er - 1.18 ERA)...Won each of his last four starts from 8/17 to 9/1 and allowed only two earned runs over 20 innings pitched (0.90 ERA). Was selected by Pittsburgh in fourth round of the First-Year Player Draft and made professional debut with the Gulf Coast League Pirates...Made two relief appearances; tossed 2.0 scoreless innings in debut on 8/25 vs. GCL Tigers and pitched a perfect frame on 8/28 vs. GCL Blue Jays. August 25, 2018 Pittsburgh Pirates recalled RHP Nick Kingham from Indianapolis Indians. August 2, 2018 Pittsburgh Pirates optioned RHP Nick Kingham to Indianapolis Indians. July 2, 2018 Pittsburgh Pirates recalled Nick Kingham from Indianapolis Indians. June 10, 2018 Pittsburgh Pirates optioned RHP Nick Kingham to Indianapolis Indians. May 28, 2018 Pittsburgh Pirates recalled Nick Kingham from Indianapolis Indians. May 20, 2018 Pittsburgh Pirates optioned RHP Nick Kingham to Indianapolis Indians. May 19, 2018 Pittsburgh Pirates recalled Nick Kingham from Altoona Curve. May 10, 2018 RHP Nick Kingham assigned to Altoona Curve from Indianapolis Indians. May 7, 2018 Pittsburgh Pirates optioned RHP Nick Kingham to Indianapolis Indians. April 29, 2018 Pittsburgh Pirates recalled Nick Kingham from Indianapolis Indians. March 20, 2018 Pittsburgh Pirates optioned RHP Nick Kingham to Indianapolis Indians. October 2, 2017 Pittsburgh Pirates recalled Nick Kingham from Indianapolis Indians. May 15, 2017 RHP Nick Kingham assigned to Indianapolis Indians from Bradenton Marauders. May 11, 2017 RHP Nick Kingham assigned to Bradenton Marauders from Indianapolis Indians. April 5, 2017 Indianapolis Indians placed RHP Nick Kingham on the 7-day disabled list. March 13, 2017 Pittsburgh Pirates optioned RHP Nick Kingham to Indianapolis Indians. October 3, 2016 Pittsburgh Pirates recalled Nick Kingham from Altoona Curve. August 25, 2016 RHP Nick Kingham assigned to Altoona Curve from Bradenton Marauders. August 15, 2016 RHP Nick Kingham assigned to Bradenton Marauders from Indianapolis Indians. August 6, 2016 Indianapolis Indians sent RHP Nick Kingham on a rehab assignment to GCL Pirates. July 8, 2016 Indianapolis Indians sent RHP Nick Kingham on a rehab assignment to GCL Pirates. April 6, 2016 Indianapolis Indians placed RHP Nick Kingham on the 7-day disabled list. March 18, 2016 Pittsburgh Pirates optioned RHP Nick Kingham to Indianapolis Indians. October 8, 2015 Nick Kingham roster status changed by Pittsburgh Pirates. October 5, 2015 Pittsburgh Pirates recalled RHP Nick Kingham from Indianapolis Indians. September 24, 2015 Indianapolis Indians activated RHP Nick Kingham from the 60-day disabled list. August 18, 2015 Indianapolis Indians transferred RHP Nick Kingham from the 7-day disabled list to the 60-day disabled list. May 8, 2015 Indianapolis Indians placed RHP Nick Kingham on the 7-day disabled list. March 20, 2015 Pittsburgh Pirates optioned RHP Nick Kingham to Indianapolis Indians. November 20, 2014 Pittsburgh Pirates selected the contract of Nick Kingham from GCL Pirates. August 31, 2014 RHP Nick Kingham assigned to GCL Pirates from Indianapolis Indians. June 12, 2014 RHP Nick Kingham assigned to Indianapolis Indians from Altoona Curve. March 29, 2014 RHP Nick Kingham assigned to Altoona Curve from GCL Pirates. August 31, 2013 RHP Nick Kingham assigned to GCL Pirates from Altoona Curve. June 15, 2013 Nick Kingham assigned to Altoona Curve from Bradenton Marauders. April 2, 2013 Nick Kingham assigned to Bradenton Marauders from West Virginia Power. April 4, 2012 Nick Kingham assigned to West Virginia Power from GCL Pirates. September 2, 2011 Nick Kingham assigned to GCL Pirates from State College Spikes. June 13, 2011 Nick Kingham assigned to State College Spikes from GCL Pirates. August 9, 2010 Pittsburgh Pirates signed Nick Kingham. August 9, 2010 Nick Kingham assigned to GCL Pirates from Pittsburgh Pirates. August 6, 2010 Pittsburgh Pirates signed RHP Nick Kingham.